Water, water everywhere... and how beautiful are the waters of Lough Erne! Corrigan's Shore sits on the edge of the seemingly infinite shoreline of Lough Erne, where fishing and non-fishing guests alike can almost dip their toes in from the front steps. The beauty of our location is, having purchased a Fishing Permit, anglers can actually fish from the garden of Corrigan's Shore B&B. 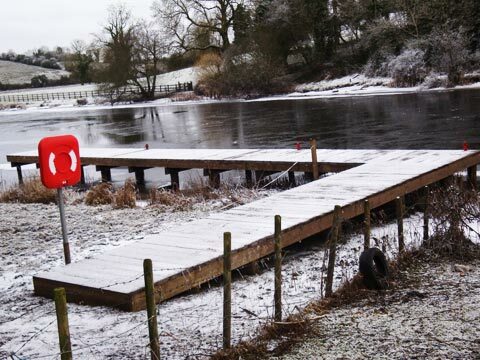 We don't know of many B and B providers in County Fermanagh that can boast of having Upper Lough Erne as their 'water feature', nor indeed of having a public jetty adjacent to their property! Ireland is a marvellous natural golfing country where courses in meadowland, parkland and superb coastal settings await the visitor. County Fermanagh is home to three prestigious Golf Courses all within easy driving distance of Corrigan's Shore so why restrict yourself to playing on just one of these when you can sample all three and more? Our location makes it easy for guests to avail of several wonderful golf courses in neighbouring counties, particularly the links courses of County Donegal which have spectacular views of the Atlantic Ocean. Wherever you tee-off you will find a warm welcome, relaxing surroundings and a comfortable night's sleep await you back at our lakeshore Bed & Breakfast. Located within Castle Coole Estate, this parkland course divides into two distinct components. The original 9 hole course was played over the mature woodland adjoining Lord Belmore's estate, with century old oak and beech trees lining the narrow fairways. In 1986 a further 9 holes were added. This front nine tests all levels of golfer, especially the intimidating starting hole. 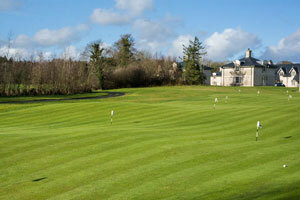 The tranquility of the surroundings, splendid lakeland views and friendly welcome make Enniskillen Golf Club memorable. Situated on the edge of Castle Hume Lough and Lower Lough Erne, in the heart of the Fermanagh Lakelands, this championship course has a reputation for being one of the most testing golf courses in Ireland. The course is famed for its curvaceous greens, rolling fairways and challenging water hazards.Castle Hume boasts some seven thousand trees and over thirty bunkers. Manicured to the highest standards, it is a model of golfing elegance. The Faldo Championship Course (7,167 yards Par 72) is an exciting challenge for golfers of all abilities. Situated between Castle Hume Lough and Lower Lough Erne, 14 of the holes have Water in play, highlighted by the iconic 10th Hole, "Emerald Isle" where the green is surrounded on three sides by water. The routing of the course takes full advantage of the natural topography and provides golfers with superb all year round playing conditions and breathtaking views of The Fermanagh Lakelands. Sleive Russell - 18 hole, champion course. 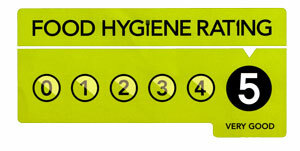 A new course built to the highest standard. Clubs, carts & buggies can be hired. Fintona - 9 hole, park land course. This course is set amongst mature trees and is 75 years old. 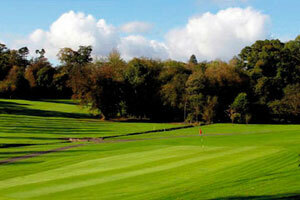 Omagh - 18 hole, park land course. Originally a 9 hole course, with another 9 holes added recently. Not very exciting scenery. Clubs & carts can be hired. Donegal Golf Club - 18 hole, links course. Donegal Golf Club is a very beautiful course on the edge of Donegal Bay. Bundoran - 18 hole champion course. Lessons available, two instructors. This course is one the oldest in the area and is on the sea front. Clubs & carts can be hired. Narin & Portnoo Golf Club - 18 hole, links course. Very picturesque course in South-West Donegal. Some very challenging holes. Rosses Point - 18 hole, links course. Is one of Ireland's great championship links. 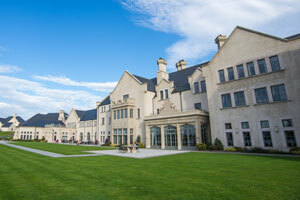 It was founded in 1894 and plays host to the West of Ireland Championship each year. If you are looking for a Bed & Breakfast close to Enniskillen for sight-seeing and day trips then our Country Bed and Breakfast may be ideal. Corrigan's Shore is just a short car journey from Enniskillen and offers guests the opportunity to enjoy relaxing, peaceful lakeside accommodation away from the noise and traffic of town. 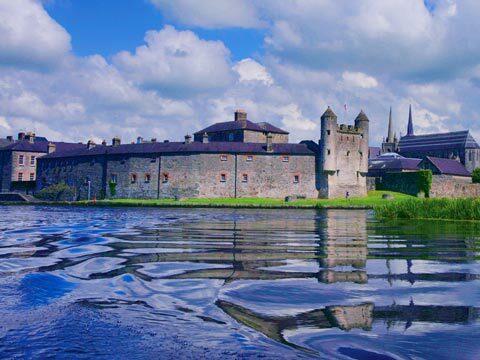 Enniskillen is the busy County Town of Fermanagh, located almost exactly in the centre of the county on a natural island that separates the Upper and Lower sections of Lough Erne. There are a wealth of sights to explore both in the town itself and just around the outskirts. The magnificent Castle Coole, a National Trust property, is well worth a visit, as is Enniskillen Castle & Museum, Cole's monument, The Ardhowen 'Theatre by the lake', the Clinton Centre, the Buttermarket Craft Centre and much, much more. Guests staying with us at Corrigan's Shore House often want to visit the many Tourist Attractions of County Fermanagh as well as further afield to the North Antrim Coast and County Donegal. Our Bed & Breakfast enjoys a central location that makes it possible to take a day-trip by car to any of the attractions mentioned below or indeed anywhere in Northern Ireland. 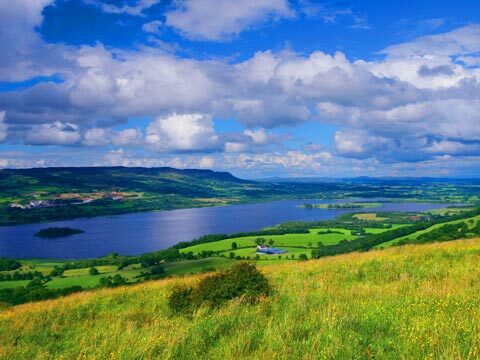 From toddler to mature adult there are an abundance of local attractions and enjoyable activities to see and do around Fermanagh. From shopping to relaxation, boat trips to heritage and cultural sites, 7 screen cinema to homemade jersey ice-cream, we have it all in Fermanagh. Information leaflets on all of the following and much, much more are available in our entrance hall.